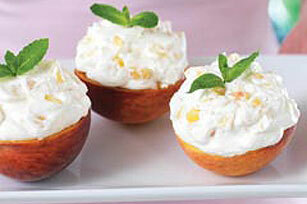 Peach halves are the edible cups for the delicious peaches 'n cream filling. Beat cream cheese, sugar and vanilla in large bowl with mixer until well blended. Gently stir in COOL WHIP. Scoop out pulp from peach halves, leaving 1/8-inch-thick shells. Chop pulp. Add to cream cheese mixture; mix well. Spoon into peach shells. Save 30 calories and 5g of fat, including 4g of sat fat, per serving by preparing with PHILADELPHIA Neufchatel Cheese and COOL WHIP Lite Whipped Topping. Of the many varieties of peaches available, freestone peaches work best in this recipe since the pits are the easiest to remove. If large peaches are unavailable, use 12 medium or 16 small peaches instead.